One can easily do a basic crystal layout on oneself by using the chakra chart and the associated crystals shown below this article as a basic guide, or simply match the chakra and crystal colors if you do not have some, or any of crystals that are listed in the table below. These layouts may be done at anytime, though I like to do them either just before I go to bed or when I wake up in the morning. The morning layouts are great for setting up the rest of the day, helping to align, energize and use the crystals’ manifestation energies to help bring my creative visualizations into reality! Each and every crystal has an association with a chakra, or even multiple ones. The table below shows a small list of examples of crystals and their associated chakras. These crystals may be placed on the chakra points in the form of a crystal layout on one’s body. Some crystals, such as clear quartz, may be used on every chakra. In fact, this style of layout is excellent for bringing balance at all levels into one’s life. 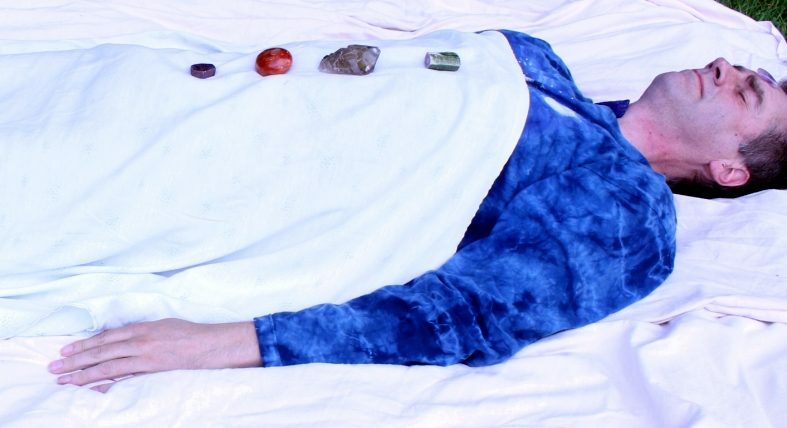 To get started, simply place the crystals beside you when you are in a seated position in such a way that as you lie down, you may place each crystal on the corresponding chakra points on your body. In the photo below I’m using a sheet to show the crystals better, but in practice I prefer to place the crystals directly onto the skin. One can warm the crystals up first in a bowl of warm water. Once the crystals are layed out, starting from your root chakra and working your way up, visualize yourself breathing in and drawing the color of each crystal into the body physical. Doing the root chakra first will ensure you are “grounded” before proceeding further up the chakra spectrum. Should visualization not come easy to you, other methods may be used such as consciously directing the color/energy of the crystal into the chakra point, or even simply “feel” the energy seeping in. Once you have settled in, do your best to empty your mind of all thoughts. This does not always come easily to some, and may take practice to achieve. A technique I used to help work my way towards emptying my mind was to let my thoughts run through my head like flowing water. If I caught myself stopping to analyze what I had been thinking, I would then focus on listening to my breath. This had the effect of letting my thoughts continue their flow. Having consistently attained that state, I found it helpful in taking the next step of emptying my mind altogether. There is no set time to do layouts; simply select one that feels right for you. These are some of the techniques I use, and there are plenty more. With this in mind, please do not ever be afraid to use your intuition when working with crystals, chakras, and body layouts!